IT MAY APPEAR an audaciously challenging project to pull off, arranging for big band the vibrant, unrestrained soundscapes of South African jazz. But then, from first-hand experience, saxophonist and composer Julian Argüelles is well placed to reinterpret the music of the townships as translated through the creative hearts and minds of their exiles. As one who has been greatly influenced by South Africa’s considerable impact on European and British jazz – which had begun back in the ’60s with the Blue Notes’ exodus from the apartheid state – Julian’s early career thrived as a member of expansive, effervescent and much-lauded ’80s collective Loose Tubes (whose reunion debut became a highlight of last year’s Cheltenham Jazz Festival). And, along with brother Steve Argüelles and Django Bates (pivotal Loose Tubers who both feature in this recording), his playing and composition became infused with that same joyful abandon and spontaneity, which also included the saxophonist’s five inspiring years with the Brotherhood of Breath big band led by Blue Notes pianist Chris McGregor. For new release Let It Be Told, drawing on his experiences as both member and collaborator with the Frankfurt Radio Big Band, Argüelles was able to write specifically for this line-up. The sumptuous arrangements here include a number of compositions from the original Blue Notes’ personnel, including Dudu Pukwana’s Mra Khali which opens the set in euphoric fashion – crackling with flamboyant percussion, evocative African guitar groove and snappy horn riffs, the leader’s rapid alto improvisations are typically eloquent. Mama Marimba promenades assuredly, its closely-clustered brass harmonies encouraging adventurous trombone and tenor sax solos. The beautiful simplicity of Miriam Makeba’s Retreat Song ‘takes a left’ midway to produce an attractive syncopated groove featuring Django Bates’ unmistakable pitch-bent synth gyrations; and the lush, restrained orchestration of You Ain’t Gonna Know Me ultimately diverts its modest, folksy tune into an infectious beat which ripples to Bates’ signature ‘steel pan’ keys. Wide African skies are conjured in a joyous reading of Pukwana’s Diamond Express as its rolls down the tracks to high trumpet (shades of Hugh Masekela) and Argüelles’ marvellously characterful, unpredictable alto (the hypnotic horn ensemble just magnificent). Abdullah Ibrahim’s much-loved The Wedding receives surely one of the most ravishing and emotional arrangements here as Argüelles’ serene, Zawinulesque abstractness precedes its hymn-like wonder; and with the entry of that most memorable of melodies (Bates adding ethereal synth), rapt admiration is the overriding response. Following Chris McGregor’s Amasi – which, in his own arrangement, dances in glorious celebration – comes a particularly inspired interpretation of Ladysmith Black Mambozo’s Amabutho, which brilliantly captures the idea of cantor and choral response as Argüelles’ alto invites deeply satisfying deep reed harmonies and high brassy declarations – a very firm favourite. And to close, Pukwana’s Come Again parties elatedly to Steve Argüelles’ clattering percussion, ‘smiling’ unison horns, whistles and rocky guitar. Argüelles says that South African jazz has “always had a wonderful balance between something accessible, melodic and grooving, and something challenging, a little bit crazy.” In his own personal way, he perfectly embodies that spirit in a rich, sunshiny big band recording which is both thrilling and, at times, surprisingly moving. A great Summer groove! 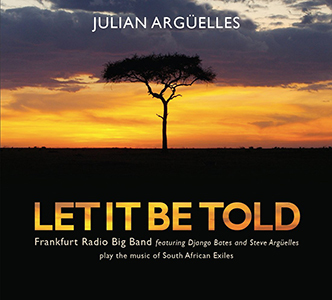 Released 27 April 2015 on Basho Records, Let It Be Told is available from Jazz CDs and all good jazz retailers.